Anybody who doesn't know how draft beer gets from wherever to the glass would probably have a totally different interpretation of this picture. Science experiment, drug lab, space alien breeding centre? Nope. Probably (one of) the biggest variety of craft beers on tap at an establishment in Port Elizabeth. This being part of the bar at BeerYard in Richmond Hill. 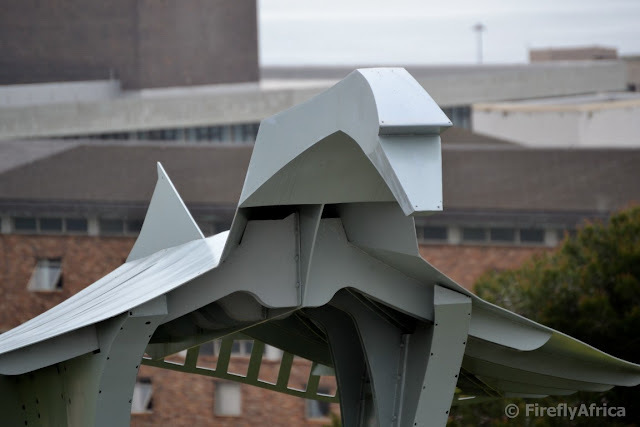 Anybody seeing the Fish Bird art piece by Dolla Sepata on the Donkin Reserve for the first time would be forgiven if they think it represents a Concorde coming in to land. The Fish Bird is a very abstract piece representing a combination of fish in the bay and birds on land and is returning to the Donkin to take ownership of this transforming site. The schools were closed on Friday and I had to take Drama Princess to work with me for the day. Somewhere during the morning we popped up to the Donkin Reserve to drop of maps and brochurs at the visitor information center there and we went for a quick walk around some of the artwork forming part of Route 67. 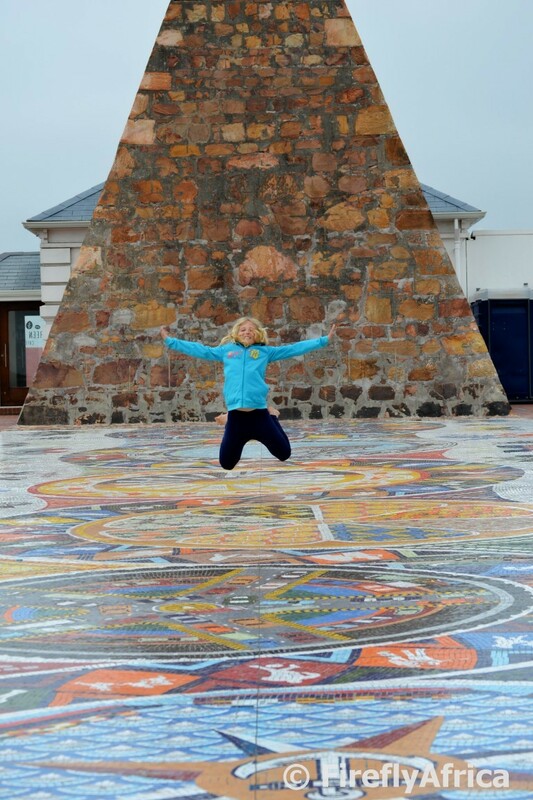 Obviously the camera went along and Drama Princess decided that a plain straightforward picture of her posing on the mosaic next to the pyramid wouldn't be enough. Spring is here and Summer is a coming so we are slowly starting to see beautiful warm days sneaking in between the colder weather. Taking the dogs for a walk on the beachfront on such a day it was great to see many others making use of the weather. Not a lot of people are swimming yet but kids and playing in the water, dogs are being walked (so are loved ones), people are starting to work on their tans, guys are fishing from the rocks and there was even a couple of yachts in the bay. Bring on Summer. I was browsing YouTube looking for a nice Port Elizabeth clip to use for this week's Video Friday and found this video of a visit to Kragga Kamma Game Park uploaded by Niezwykly Swiat - Wonderful World. Unfortunately the rest of the text in the description looks like it could be Russian so I can't really tell you more about the person who uploaded it. Have a look at the video, pack a picnic and head over to Kragga Kamma Game Park this weekend. The park is looking stunning after all the rains we've had and there are lots of babies around. Today is Heritage Day in South Africa and all South Africans celebrate the day differently. Some like to dress up in their traditional clothing while others come together for a braai. Political parties have gatherings, clubs use the day to organise events and some people just stay home and do a few chores or watch tv all day long. I celebrated Heritage Day with my fellow Geocachers at the Van Stadens Wildflower Reserve taking part in the second annual Geocaching Amazing Icon Race. The event took us all around the whole reserve before we had a braai for lunch. It's Braai Day as well after all. Afterwards I took a drive around the reserve again with my camera as the proteas and many other flowers are all decked out in the Spring best. 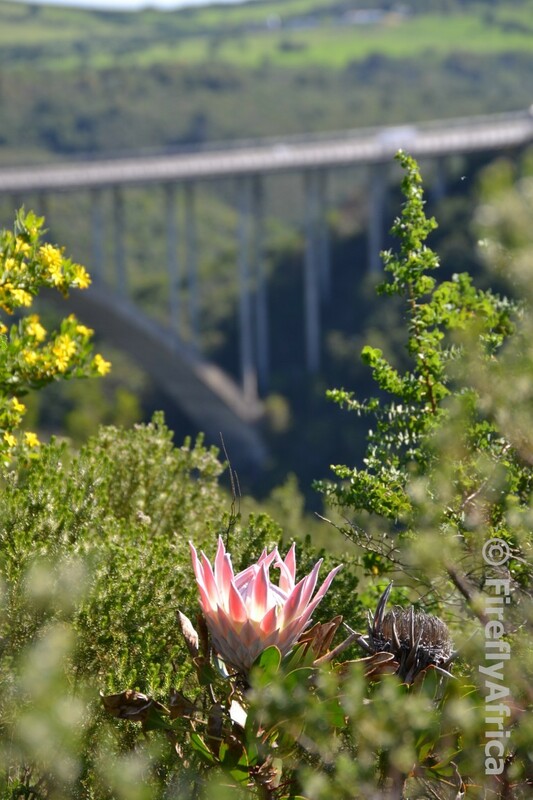 One of the pictures I snapped was this one of a King Protea with the Van Stadens Bridge in the background. I received this breathtaking picture of the Apple Express crossing over the Van Stadens Railway Bridge, the highest narrow gauge railway bridge in the world, from fellow Geocacher Graham Chrich yesterday. Graham was in the Van Stadens area for the Rhino Run last weekend and decided to do a couple of Geocaches located in the area. 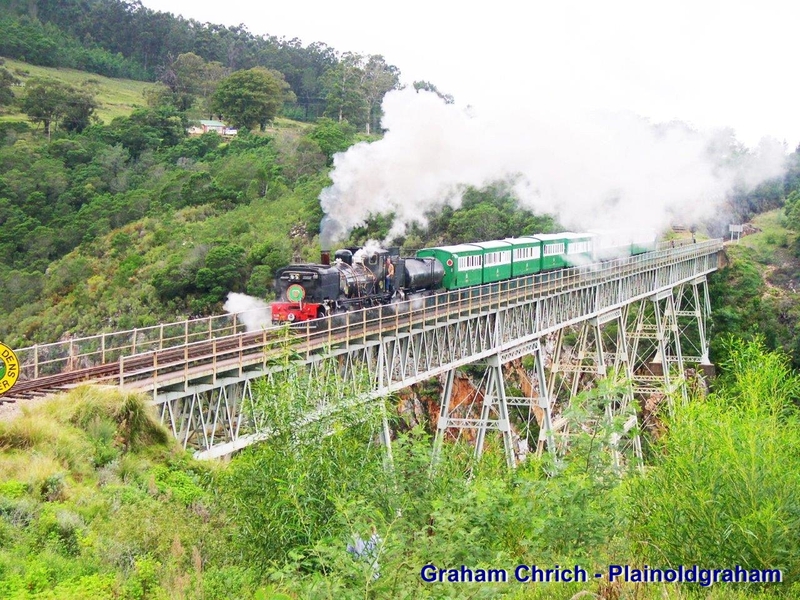 Looking for info on the gorge he came across a post of mine about the railway bridge and it reminded him of a trip they took as a family on the Apple Express when it was still running. As usual the train stopped short of the bridge allowing passengers to walk across before following. This was when he took this picture. How we all long for the Apple Express steam train to run again. Dockside Brewery in the Baakens Valley doesn't just brew craft beer for the drinking market. They also brew a craft beer specially to bake beer bread with. Their very first beer wasn't the best drinking beer but they quickly found out that it was perfect for baking beer bread so they continued making it. As they put it, All of the flavour has been imparted into the beer leaving the dry ingredients very basic, resulting in an original unmistakable extraordinary loaf of beer bread. In their shop they sell beer bread kits with a bottle of beer, all the dry ingredients and a tin foil pan to bake the bread in. We enjoy beer bread so I decided to get a kit to try it out. We followed the included recipe and instructions carefully and this was the result. 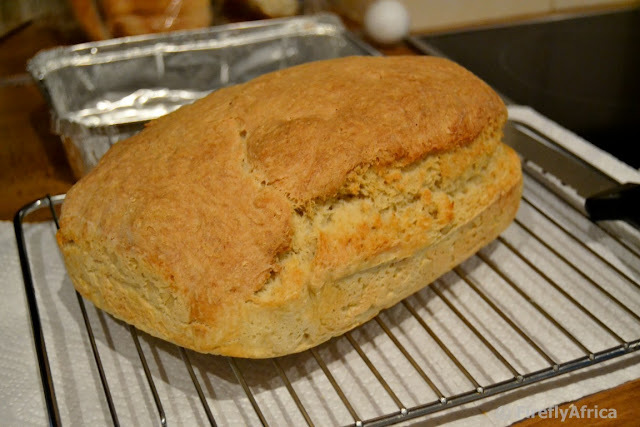 A yummy flavorsome beer bread. Yummy! Have you ever heard of the Dockside Brewery? I want to bet my bottom dollar (ok, so I'm not a betting man, is really confused with why the dollar is at the bottom and why are we talking dollars and not rands?) that you have probably never heard of the Dockside Brewery. 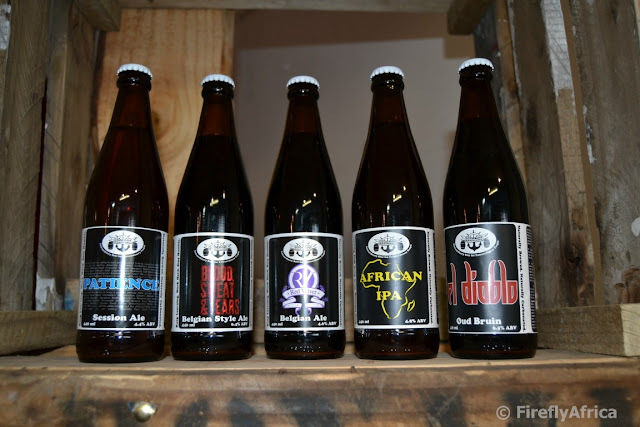 Located just behind the Herald in Horton Street in the Baakens Valley, the Dockside Brewery has been producing beer for just over a year and is breaking some serious ground when it comes to craft beer in the city. They create a number of very unique beers which isn't for anybody, but those who appreciate a proper craft beer will really enjoy it. They don't compromise on quality, don't skimp on the ingredients they use and take much more time to produce a lot less beer than most other breweries. 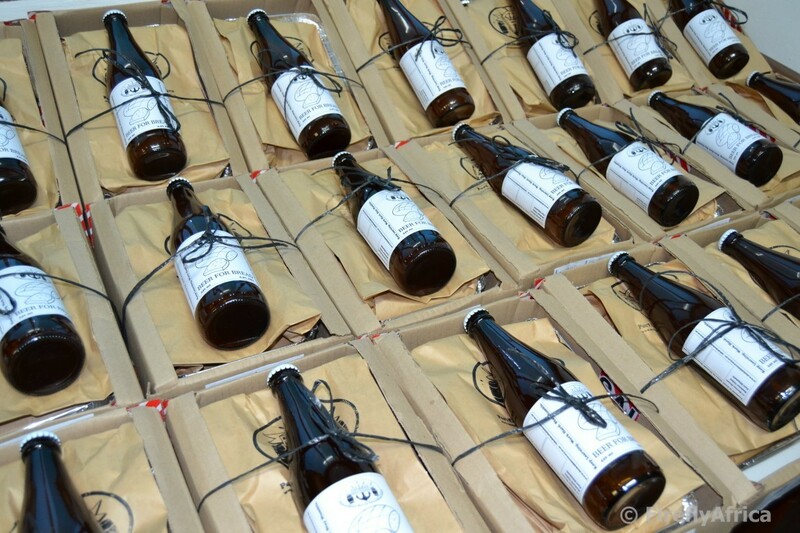 While a lot of craft breweries can produce ales in 11 days, they take between 42 and 56 days. 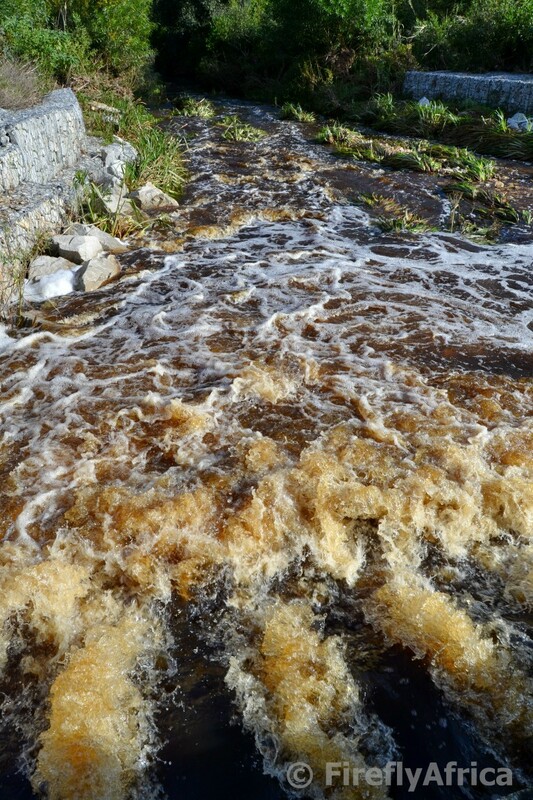 They also use spring water from the Elands River Valley and not the municipal water supply. Dockside also don't produce their craft beer in kegs as draft but rather bottle it and also sell directly to the public. I discovered Dockside Brewery on the recent Hop on Beer Route tour I went on and got to taste their craft beers while there. So if you're a beer lover, do head down that way and go and check them out. One of the lesser known museums in Port Elizabeth is the Prince Alfred Guard Drill Hall in Central. 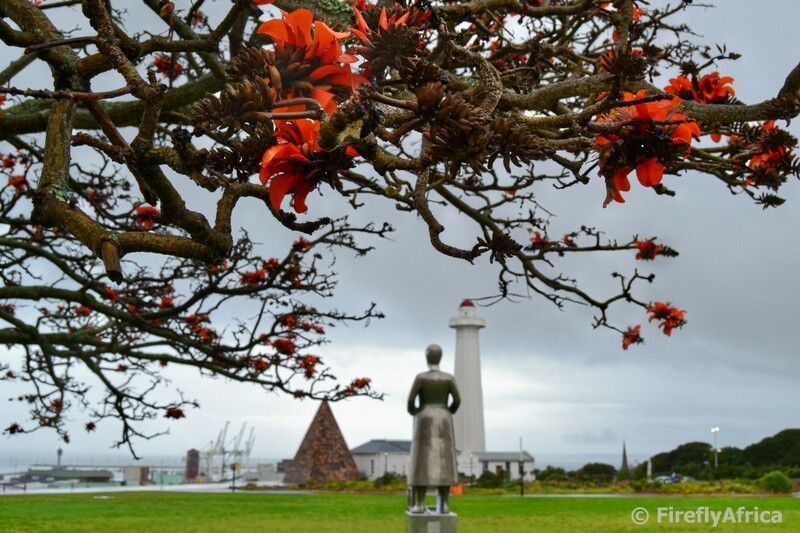 The museum was established as a fusion between the old military museum that was housed at the Donkin Reserve and the old Prince Alfred Guard regimental museum. The Prince Alfred Guard was founded in 1856 as a City Regiment but had their name changed when they provided a Royal Guard for Prince Alfred, the second son of Queen Victoria, on his visit to Port Elizabeth in 1860. The Victorian Drill Hall was opened in 1880 and has been the regiment's headquarters since then. 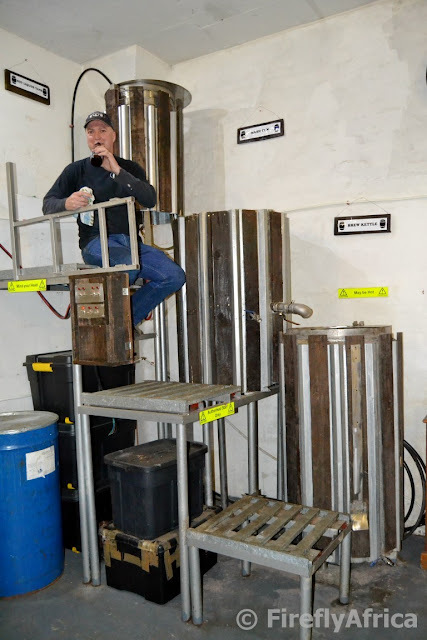 A brewery tour at The Bridge Street Brewery is a special treat if you have the privilege of having master brewer Lex Mitchell do the tour. Lex started his career in beer making joining Ohlssens Brewery in 1977, moving on to Amstel where he left as master brewer in 1981. 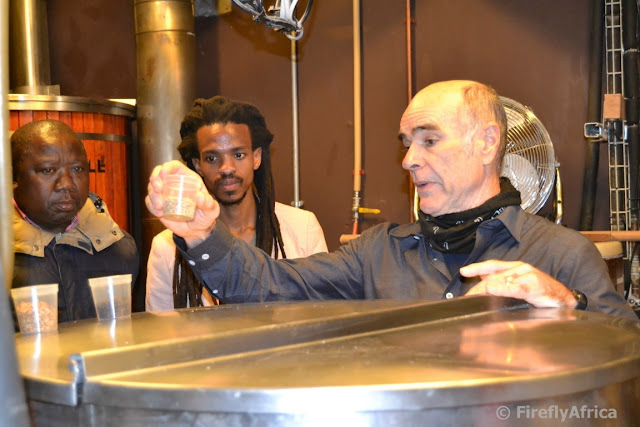 He then started Mitchells Brewery in Knysna in 1983 where he produced the very popular Foresters Lager and Bosuns Bitter. 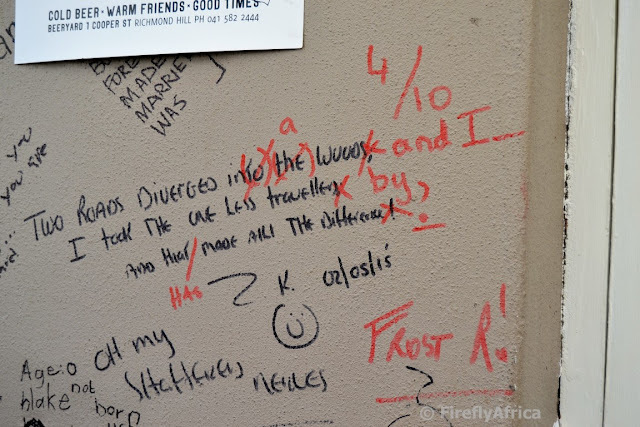 After moving to Port Elizabeth in 1995, Lex sold Mitchells Brewery in 1998 although he stayed involved until 2002. Bridge Street Brewery was established in 2012 with the first brew being mashed. Today Bridge Street Brewery, under the guidance of Lex Mitchell, brews three distinct beers (Celtic Cross Pilsner, Boar’s Head Bitter, Black Dragon Stout) and a cider (Bowman Cider), all which can be tasted after a tour of the brewery. I was looking for a video to post for this week's Video Friday and came across this awesome video of the Boardwalk's Fountain Spectacular by Limewave on their YouTube channel. Enjoy. 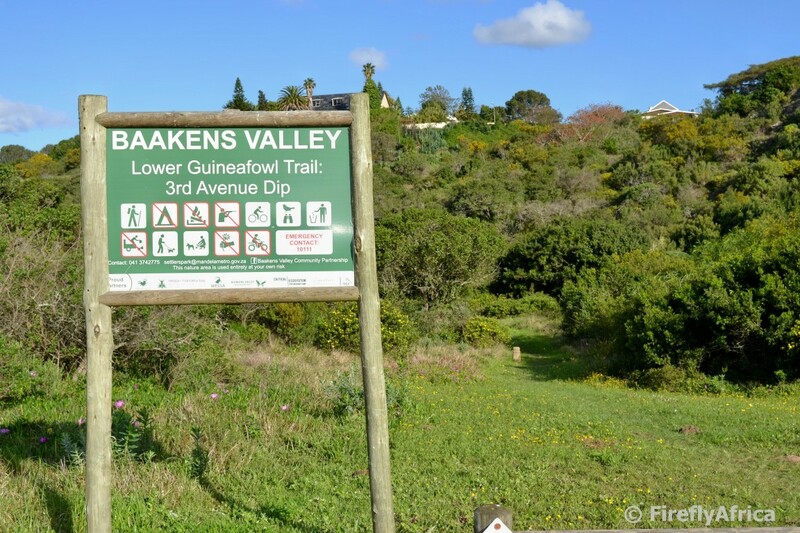 The 7,5 kilometer Lower Guinea Fowl Trail stretches from the 3rd Avenue Dip to Settlers Park. Although there are several access points onto the trail, the official start is at a parking area right next to the low water bridge in the Dip. 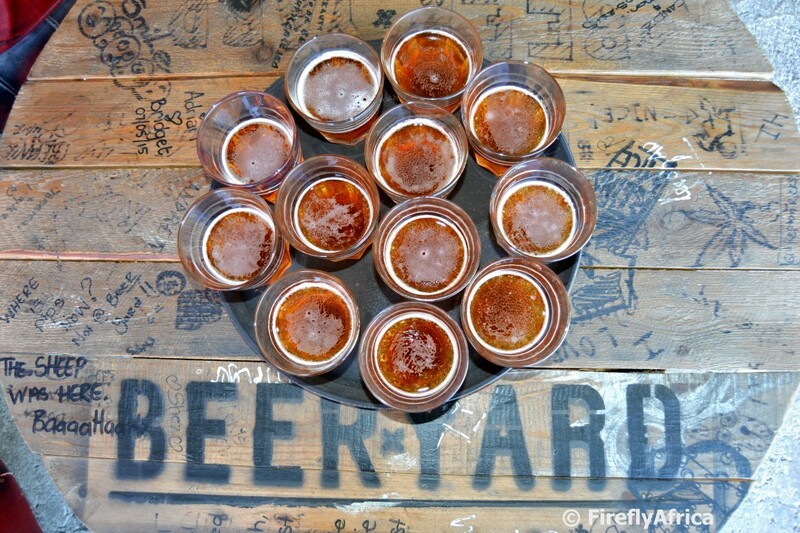 Bridge Street Brewery is more than just a place where they brew award winning craft beer. 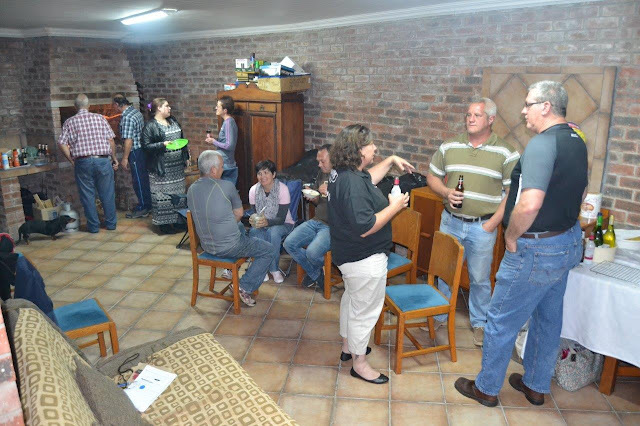 They also serve the best food and have become a great place to get together with friends. You know your language is bad when a Grammar Nazi corrects your graffiti grammar. I spotted this at the Beer Yard in Richmond Hill last week while on the Hop on Beer Route Tour. 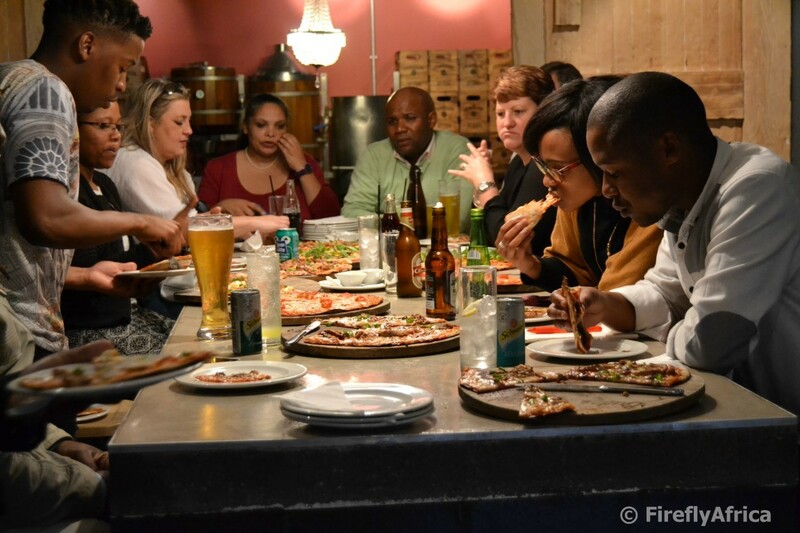 Last week I joined Nelson Mandela Bay Tourism and Gecko Tours on the inaugural Port Elizabeth Hop on Beer Route Tour. 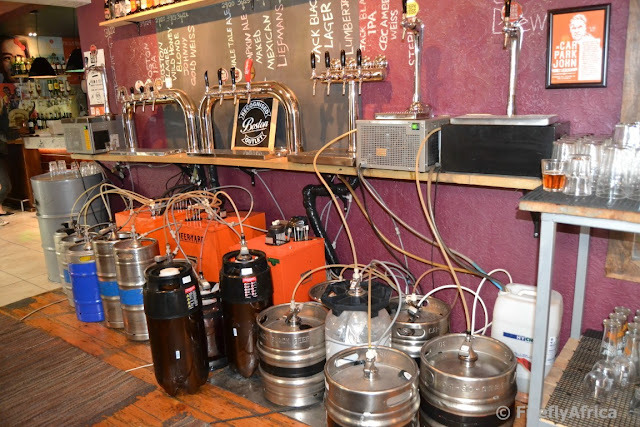 The tour visits three micro breweries in the city and at each stop you get to taste 4 "beers" (beers in " " because there are 10 beers and two ciders) plus a meal at the last stop. I took my camera with so over the next week or two you'll learn more about these micro breweries and what they have to offer. Don't worry though, I'll stick some other posts in between so it won't be beer day in and day out. LOL!!! Anyhow, we started off at the Beer Yard in Richmond Hill and I got to snap this pic before the first lot of tasters got snapped up. The Floradale Nursery that used to be on William Moffet recently moved into their new bigger and better premises on Circular Drive. We stopped by for a look last weekend and wasn't disappointed. In addition to a bigger shop and expansive outside display area of plants, pots, ornaments and other garden accessories, the popular The Rose Garden coffee shop also has a new space with both inside and outside seating. 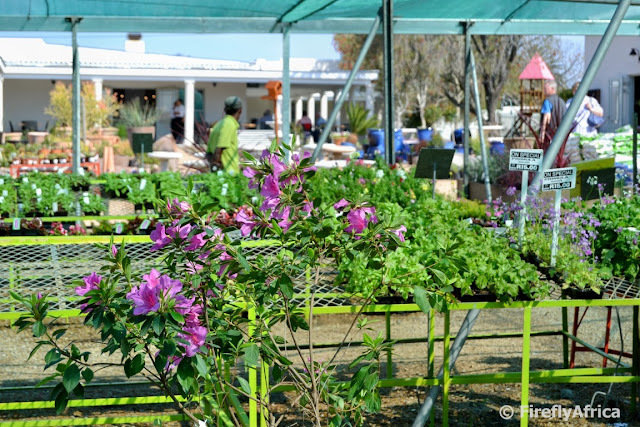 Just for interest sake, Floradale is one of the oldest garden centres in South Africa and was established in East London in 1937. 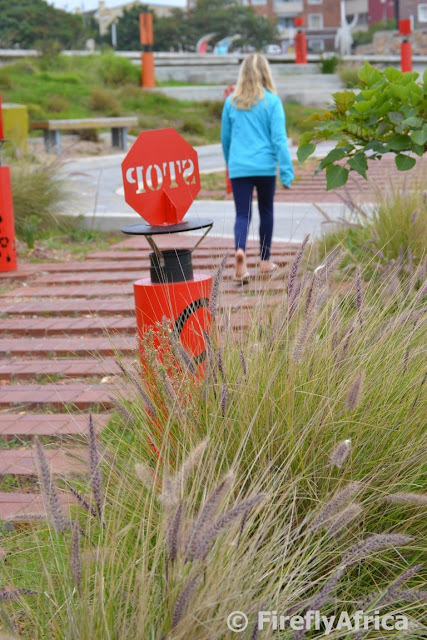 The kiddies bike path in front of the Walmer Library is the perfect spot to teach your kids about the rules of the road. I think the best thing about it is the working traffic lights. Although the KidZ are now too big to go and ride bike there, I stopped there last weekend to check up on a Geocache I have in the area and decided to snap a pic. No kiddies riding around today though. I was digging around for a video to post for this week's Video Friday and found this short about Port Elizabeth's beaches on Rooms for Africa dating back to 2010. It will be hard to disagree with anybody saying that we really have magnificent beaches here in PE. As one drives through the 3rd Avenue Dip from Mangold Park side through towards Newton Park, there is a parking area to the right just after the bridge from where the Lower Guinea Fowl Trail starts. On the edge of this open space is a stone bench with plaque on it. 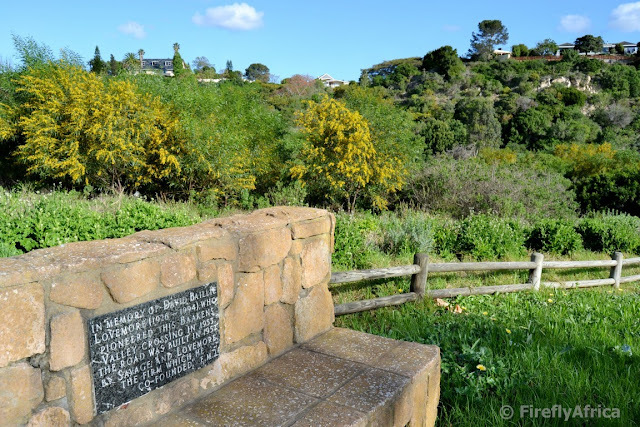 The bench and plaque is a little "monument" to David Baillie Lovemore (1926 - 1994) who pioneered this crossing of the Baakens Valley in 1955. The road itself was built by Savage and Lovemore (a firm he co-founded) in 1957. Now there's a bit of info I bet you didn't know. The Nelson Mandela Bay Tourism head office recently moved from their old premises in South End to new offices in the Donkin Street Houses. 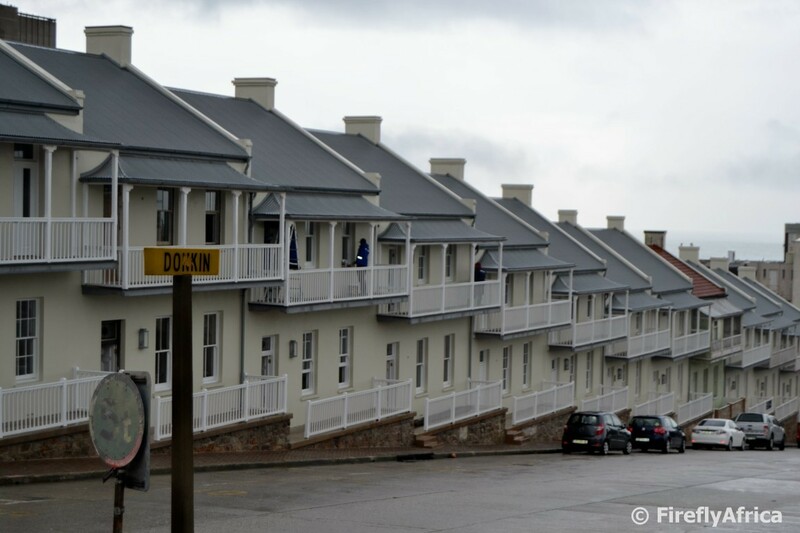 The newly renovated Donkin Street Houses form part of the Donkin Village precinct which includes the city blocks of Donkin Hill, Constitution Hill and Victoria Street. This post isn't intended to start yet another discussion on how the restoration was done and how the houses doesn't look like they historically did. 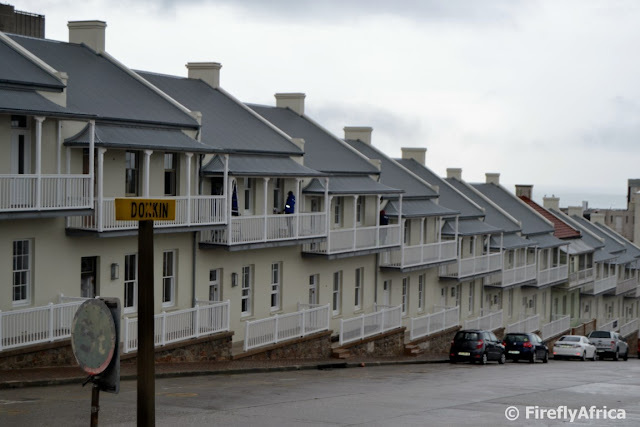 Regardless of all this, the houses are finally looking presentable again and once all the work on the rest of the precinct is completed it will really add a lot of value to inner-city rejuvenation in Port Elizabeth. During the recent heavy rains the 3rd Avenue Dip was closed a couple of times again. After it opened up Drama Princess asked if we could stop down at the bottom because she wanted to see the water. The Baakens River was still flowing strong and water was gushing through the pipes under the road. Have you ever visited the GFI or Ron Belling Art Galleries? Do you know any of these two art galleries? The Ron Belling Art Gallery and the GFI Art Gallery. Perhaps the former sounds familiar. Not sure about the latter? Well, they are one and the same thing. The gallery is housed in a landmark Art Deco style building across from St Georges Park on Park Drive. 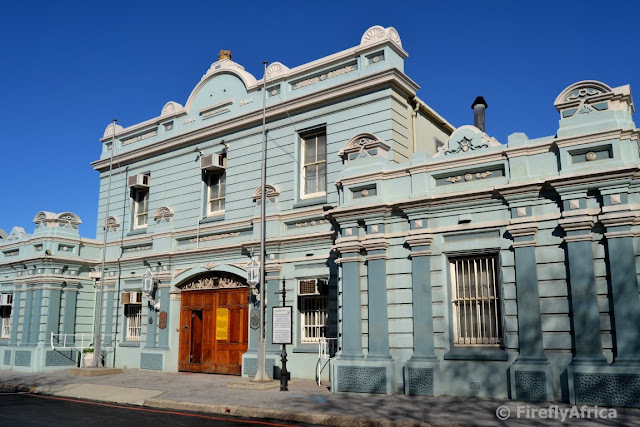 The building, named "Ridgewood", was commissioned by Axel Stockelbach, then managing director of Ford South Africa, in 1936 and was designed by Gertruida Brinkman, the first woman Architect to qualify in South Africa. 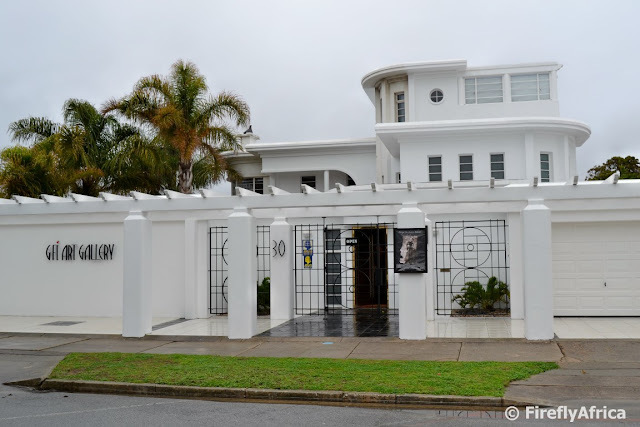 In 1988, Port Elizabeth businessman Philipp Rowland Gutsche bought the house and it was converted into an art gallery to house the Ron Belling Military Aviation Collection of paintings. Mr Gutsche passed away in 2000 and the Gallery Board is now chaired by his daughter Dorothea Moors. The gallery was initially called the Ron Belling Art Gallery and the majority of what was on display was part of the Military Aviation Collection. Two or three years ago it was decided to change the direction of the gallery and not just focus on Ron Belling's art. The name of the gallery was also changed to GFI (Gutsche Family Investments) Art Gallery. I made a quick visit to the gallery the other day and had a look around a excellent exhibition that is on at the moment. My biggest disappointment though was that there wasn't one Ron Belling on display in the whole gallery except for a few prints behind the reception counter. I really hope that once the additions being made to the gallery is done that a permanent Ron Belling display area will be set aside. I love watching music videos and adverts (I don't say movies and tv programs cause we haven't really had any) that's been shot around Port Elizabeth and spotting places I know. 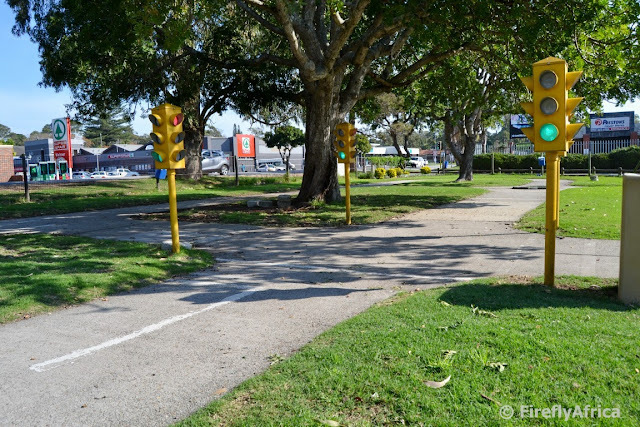 One of my friends posted a link to this music video for Stuart Reece's Silver Rocket Cadillac on Facebook yesterday and as it started I realized that it was shot right here in PE. See if you can identify a couple of the places they filmed at. Have you ever wondered why the road at the bottom of Valley Road is always wet? Why there is water running over the road even if it hasn't been raining. Well, here is the answer why. 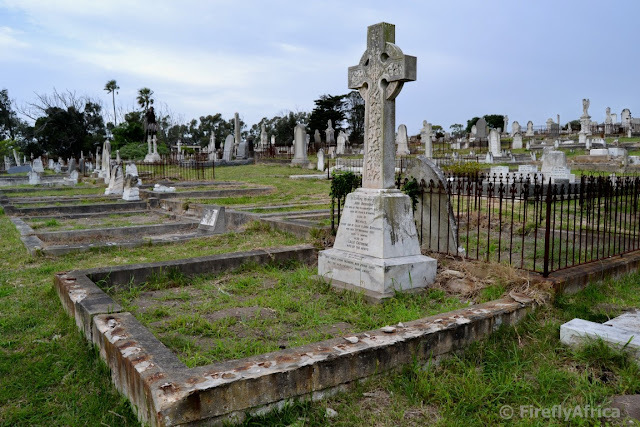 Port Elizabeth isn't really know for it's earth quakes, but that doesn't mean that it's never happened. There are three ancient fault lines in Port Elizabeth where some slight movements can still occur. One of them, the Moregrove Fault, runs along the Port Elizabeth beachfront from Pollok Beach, Summerstrand, along the shoreline, through the Baakens Valley and ending at the Moregrove quarry near the Kragga Kamma interchange. Another, the so-called Chelsea- Noordhoek Fault, runs parallel to the Schoenmakerskop coast, while a third fault runs in the Coega area. In some places in the Baakens Valley the quartzite rocks of the Moregrove Fault is visible. The old sandstones have been heated to such an extent that all the grains interlock, making it a very hard rock. One side of the rock has dropped down relative to the other as a consequence of Pangea breaking up and the formation of the super-continent Gondwana. Its this drop that has formed the fault. 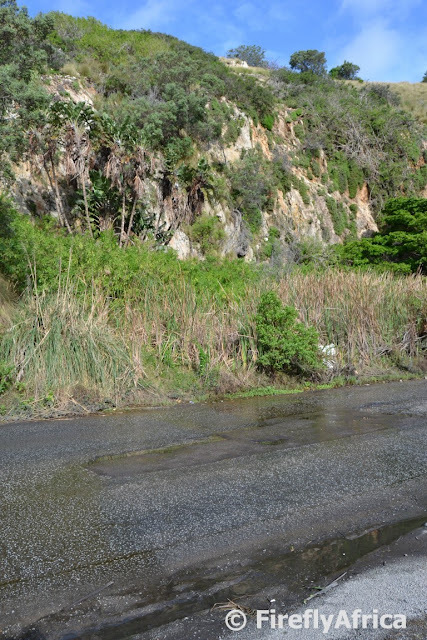 The water which continually runs across Lower Valley Road near the old PE Tramways building is underground water seeping to the surface through the Moregrove fault. This fresh water used to flow into the fresh water lagoon that was situated at the mouth of the Baakens River. The lagoon was filled in at some stage and the river contained in a channel which is only about two meters wide at this point today. 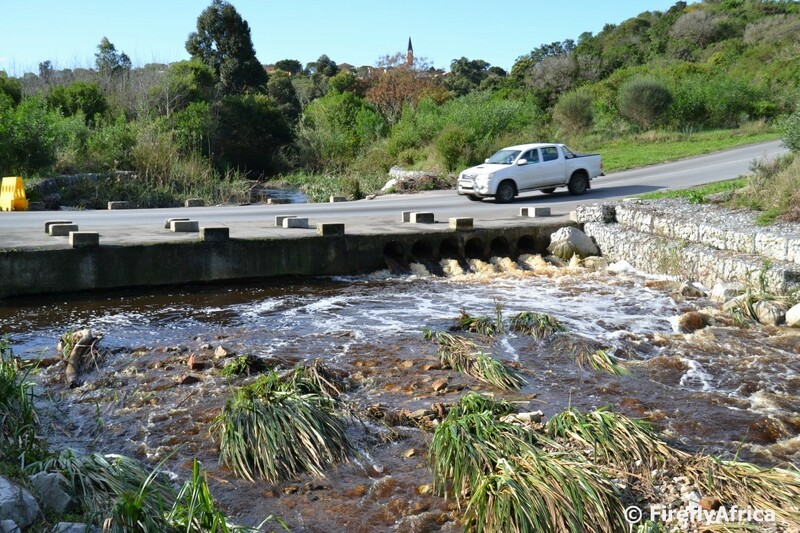 The water now forms a vlei area next to the cliff before flowing over the road and trickling down to the river. This morning I got to attend the media launch of the upcoming Jazzy, Boozy, Cheezy Affaire that will be taking place on 26 and 27 September at Africanos Country Estate in Addo. 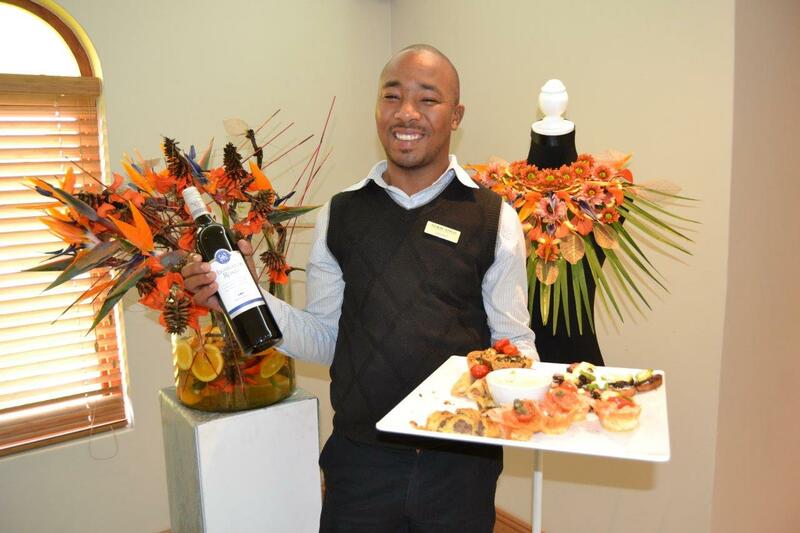 Anybody who is into wine, cheese, food, jazz, chocolates, flowers or perfume would really enjoy the event as all of that and more will be represented over the weekend. A “sensory spring sensation” will provide a fine feast for all five senses of lovers of laid-back jazz, full-bodied wine and craft beer, excellent cheese and scrumptious snacks this spring at the first Jazzy, Boozy, Cheezy (JBC) Affaire. It will be hosted at the up-market Africanos Country Estate outside Addo in the picturesque Sundays River Valley over the weekend of September 26 and 27. Among the highlights will be cooking demonstrations by celebrity chef Reuben Riffel on the Saturday, and local chef Grace Duckworth on the Sunday. The demonstrations will pair food with scents and flower art that will provide a sensory sensation built around the neroli scent – which is produced from the bitter orange. “With the citrus trees in full bloom, we believe it is the perfect venue to host an event that will delight all five senses,” says organiser Jenni Honsbein. Greeting guests long before they arrive will be the heady scent of orange blossoms, which envelopes the Sundays River Valley over September and October. “It really is one of the best times of the year to get out into the beautiful countryside which is so near to Port Elizabeth. “Orange blossoms are also traditionally associated with good fortune, which is why they are so popular in bridal bouquets and head wreaths for weddings. So there is no better harbinger of the spring promise of new beginnings,” says Honsbein. “Delighting the ear will be live jazz which will be played throughout the weekend by an eclectic mix of some of the province’s top jazz musicians. Taste buds will be titivated by fine wines, full-bodied craft beers, aromatic coffee, local hand-crafted cheeses, artisan chocolates, oysters, sushi and more. We are bringing the Cape Winelands to the Sundays River Valley. Some of the top estates in the country will be represented at the JBC,” she says. Beer lovers will be able to savour some of the country’s finest craft brews, some of which are new to the Sundays River Valley. “Eyes will feast on a special floral display by German-trained designer Fayette Scherwinski. “It will all come together as a feast for the senses at the JBC Affaire which, judging by the enthusiastic response to the concept, will become an annual event,” she says. Special accommodation packages will be available from Africanos and other guest houses and boutique hotels in the Sundays River Valley. Contact Africanos at 042 233 0030 for more information or to book your tickets. It is the first of September and thus Spring Day. As is the case more often than not, Spring hasn't quite sprung and was welcomed with a shower... or two, three... Let's just say it's a bit wet out there. But rain means PE is getting a proper wash and is looking clean and green. Don't worry though, it's downhill towards proper Spring and then Summer from here. Happy Spring Day.